Welcome to the 420th Tablescape Thursday! 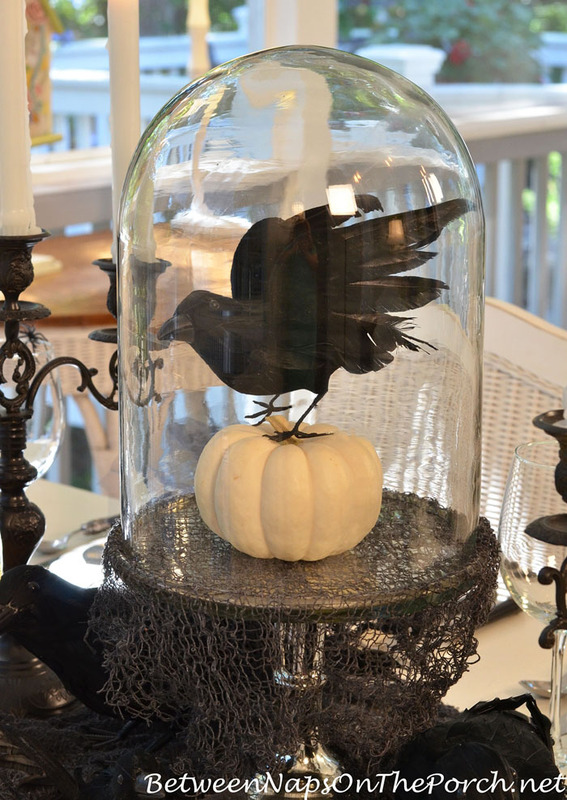 The cooler days have me in the mood for a Halloween table this week. I have a friend visiting and she and I had fun putting this one together. It all started with some whimsical black and white dinner plates I spotted in HomeGoods earlier in the week. They reminded me so much of MacKenzie-Childs dishware, but the price was a lot more in line with my tablescaping budget. Forgotten where I found these beaded, spider napkin rings, I think it may have been in Pier 1. 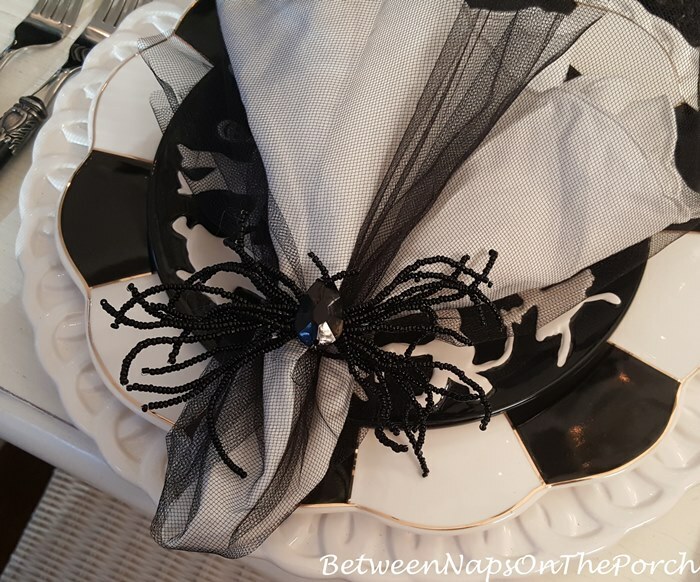 The napkins are just white napkins covered with black tulle purchased in a local fabric store. Tulle is so easy to use because it doesn’t unravel. You just cut it to the size you need, no sewing required. Love these Trick or Treat plates by Global Design Connections, designed by Kate Williams. I think I found these a few years back in HomeGoods and filled in with a couple more from eBay, if I’m remembering correctly. They were the perfect compliment to the Cynthia Rowley black and white dinner plates I just picked up in HomeGoods. Flatware is available and on sale HERE in several colors. You’ll also find it HERE. I love using this pattern for Halloween tables. Chargers are from Horchow back in 2008. 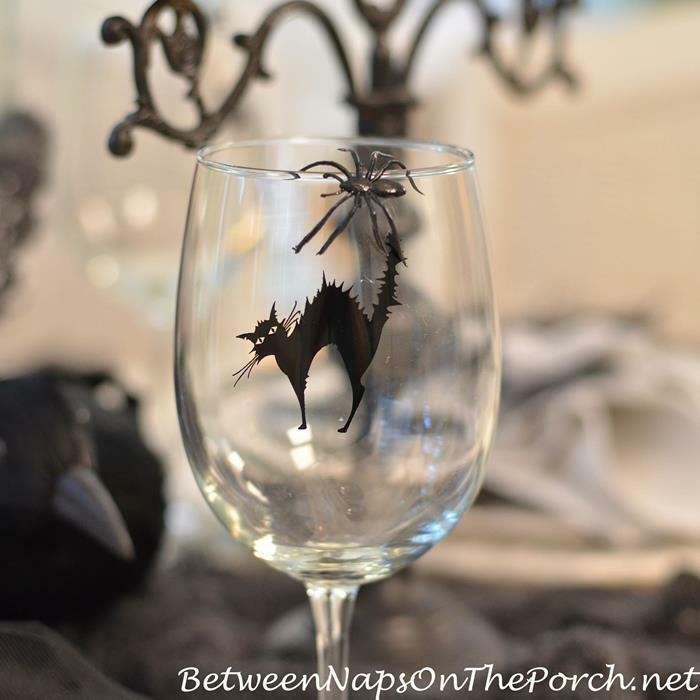 Found the arching black cat Halloween glasses a couple of years ago on eBay. 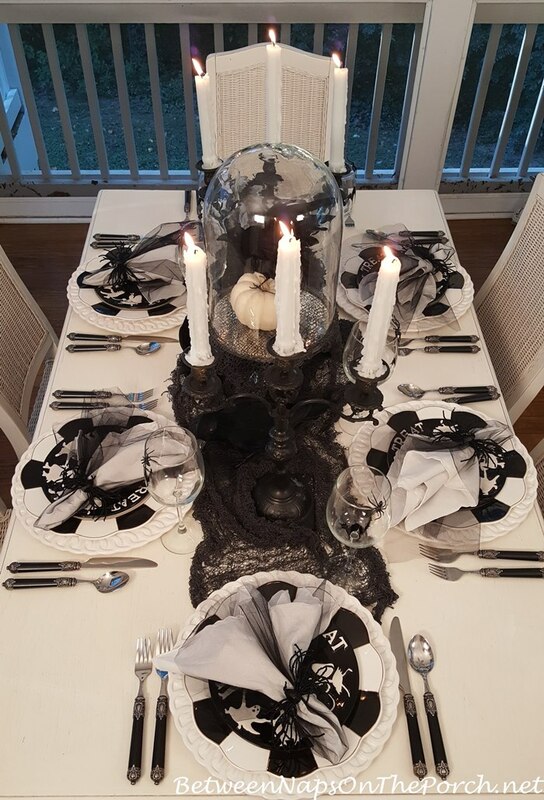 The centerpiece for this table was easy to create, just draped a little “creepy” cloth over the pedestal for an extra creepy factor. You can find creepy cloth in Dollar General, I saw it there this year when I stopped by. It also makes a great tablecloth for a Halloween table. 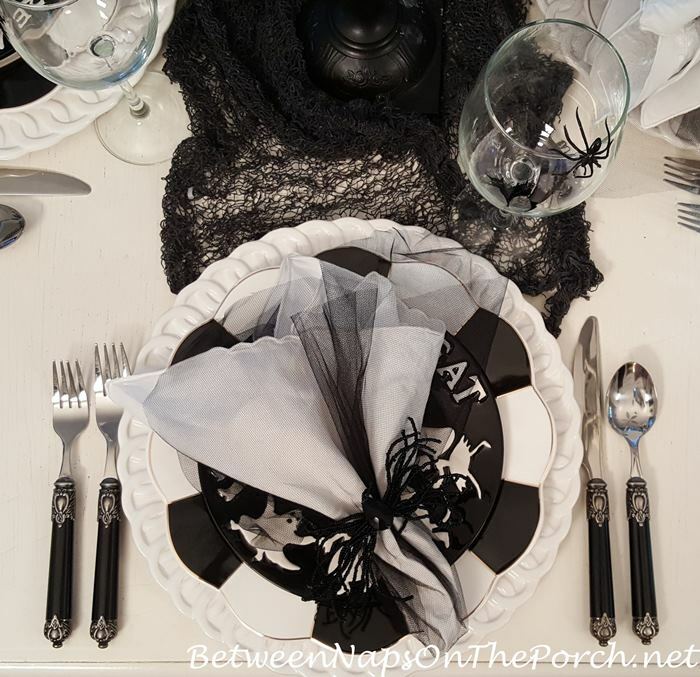 I used it as a table runner down the center of the table for this Halloween table setting. 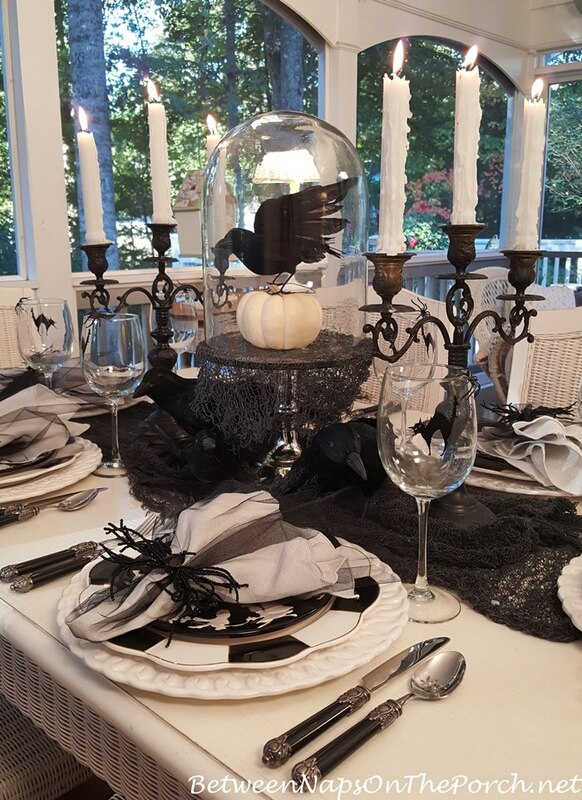 Love your black and white Halloween table Susan! I picked up those same black & white dinner plates at HG last year and love them! P.S. It looks like Met Monday links are still at last Tablescape Thursday. Thanks, Mary! They had to remove the caching plugin, it just wasn’t working properly. The links on last week’s post should show now that they plugin has been removed. Great table, as always, Susan. I love your new dinner plates, and I’ve always liked those Halloween salad plates. Those black candelabra make me want to paint some, and the dripping wax on the candles is perfection. Thank you for hosting. 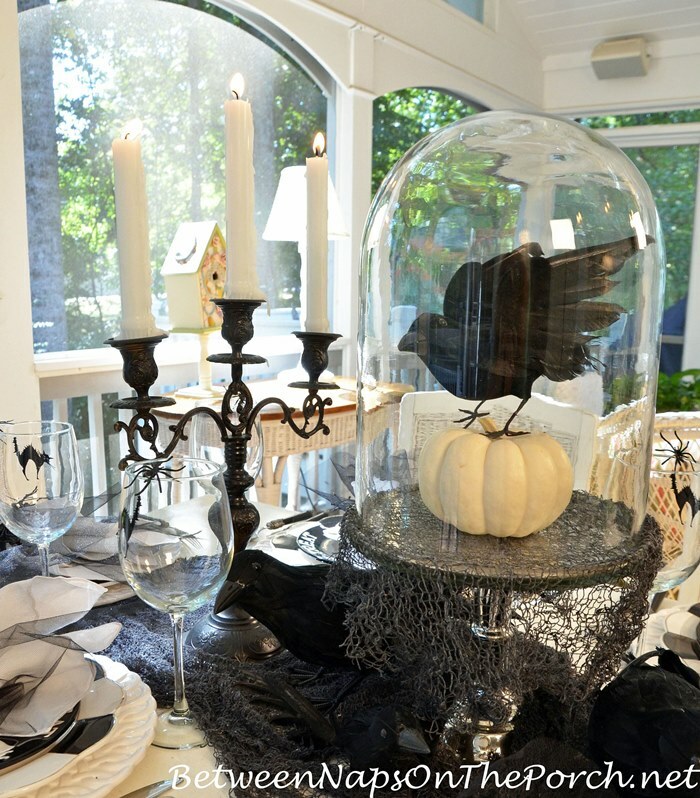 Love this spooky tablescape especially the Trick or Treat salad plates. Thanks for all the great ideas. 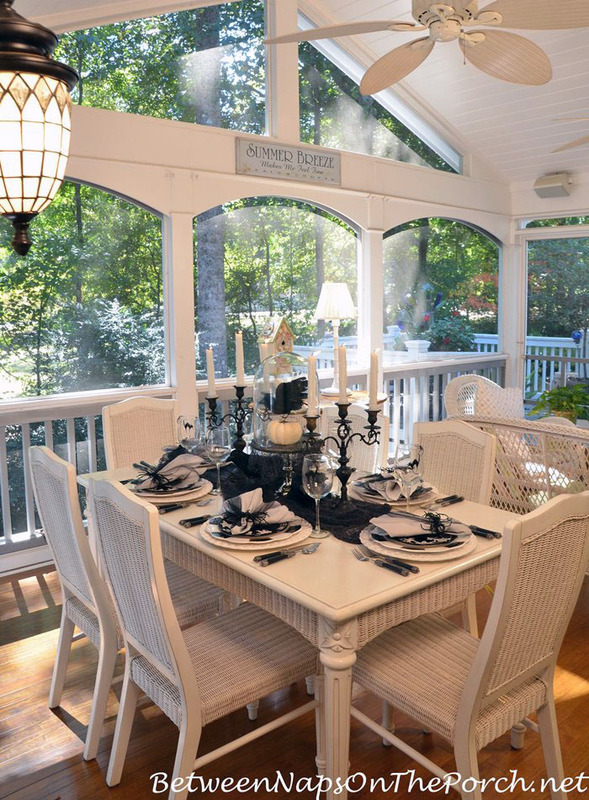 What a fabulous setting for a Halloween dinner. I think you need to have a party!!! Thanks for hosting! Halloween parties are so much fun, Pinky…especially the costume parties. Love them! lol I know, dangerous place to shop! I know you are glad you kept them! Thanks so much, Jenna! I hunt all year at GW and thrift shops for blk and orange dishes, bowls, silverware. I add blk halloween stickers to glass wear (wash off easily, no need for specific glasses to store). Spray paint blk candle holders, outside of tea pots, ornate silverware (spray paint the handles). Lots of crows and spiders, love Halloween. Love your table scapes! PS: the painted handles of the silverware, no problem in the dishwasher, comes out great. Great ideas, Marge! So smart to look for those throughout the year, then you’re ready once Halloween gets here. 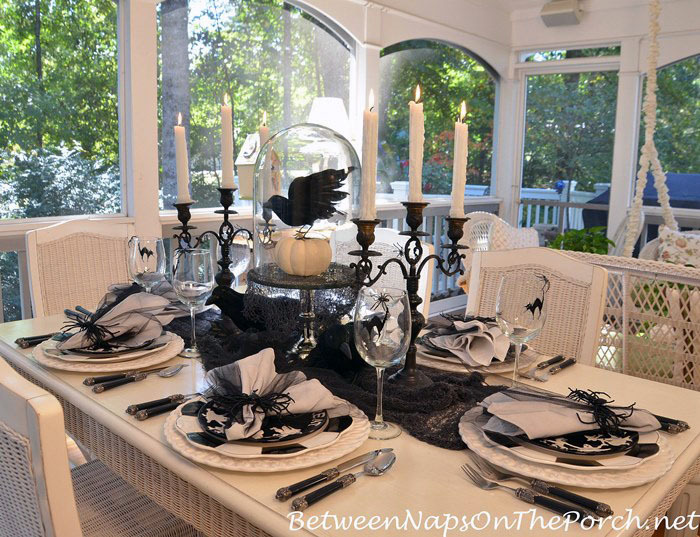 Love the black and white Halloween table! And those Cynthia Rowley plates are perfect under your Halloween salad plates. (I have a pink and white teacup and saucer in that pattern which I love, I’ll keep my eyes out for more!) You and your guest did a great job on this one. I love the Black & White for Halloween. I need to go to Home Goods, last week they did not have those in my store. The Trick or Treat plates are so cute too, need to search for those! Have a fun visit with your friend! Hope they have them in now, they were very reasonably price. Thanks, Charlotte! We’ve been everywhere this past week, it’s been a lot of fun! So spooky and fun! You always have such inspiring tables, Susan. I love that it’s black and white–no orange! It is immediately striking. And probably more so at dusk (photo hint). Ooooh, the centerpiece is my fave. It may seem colorless at first but so. much. texture. brings it to life. Love it. That tablescape really must have been so fun to create. Oh, wish I had taken one before I took the table apart. I didn’t think to do that. Drat! Oh you know I love Halloween! This is wonderfully spooky, Susan!! Would love to find a few of those cat glasses. Okay, now I’m inspired to get busy! I love decorating the table for Halloween. I always use your blog as inspiration. I have the flatware in the picture. I have a question. On yesterday’s blog (Oct. 5th about the coca cola museum) I posted a comment and it never posted. I also don’t see any comments on yesterday’s blog although it shows on your home page there are comments, 16 I think. Anyway, is there a problem with your site? Edith, do you have ad block on? I know that will prevent comments from showing. Oh wow Susan! 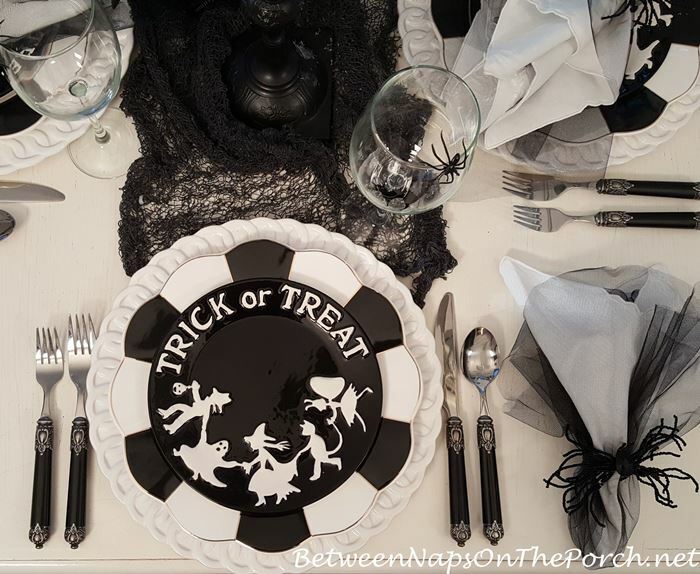 I’m crazy about your black and white Halloween themed table! So fun! ;0 Pinning away! It looks awesome! So Gothic but still fun! Have a wonderful weekend. Thanks Lynn, you as well! After reading each of your posts I immediately try to find everything you used for your tables! I wish you were my personal shopper because I love everything you do! Now I’m on the hunt for Halloween plates– hard for me because I use a wheelchair. But my fingers can do the searching on-line! I look forward to your next post, Susan! Love the black and white, it looks so smart. I think anyone visiting you is very lucky and must have a great time. Beautifully elegant, Susan! Thank you so much for hosting the party! Well, you know I’m a fan of this table. I wish I could find a set of those plates. I have the salads, but not the dinner plates. I’ll keep looking. Anything black and white catches my heart. 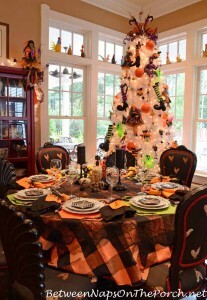 ‘-) The darling trick or treat plates are a perfect topper to the dish stack. Fun table all around, Susan! A little creepy cloth goes a long way! Very pretty Susan and thanks for hosting. Very nice. I was at the Dollar Tree store yesterday and saw they had stem ware glasses that were in the shape of a skull. They had them in orange, clear and black. When I saw them I thought of you and your Halloween tables. I love this setting, and perfect against the backdrop of your white table and chairs! Very cool, indeed. 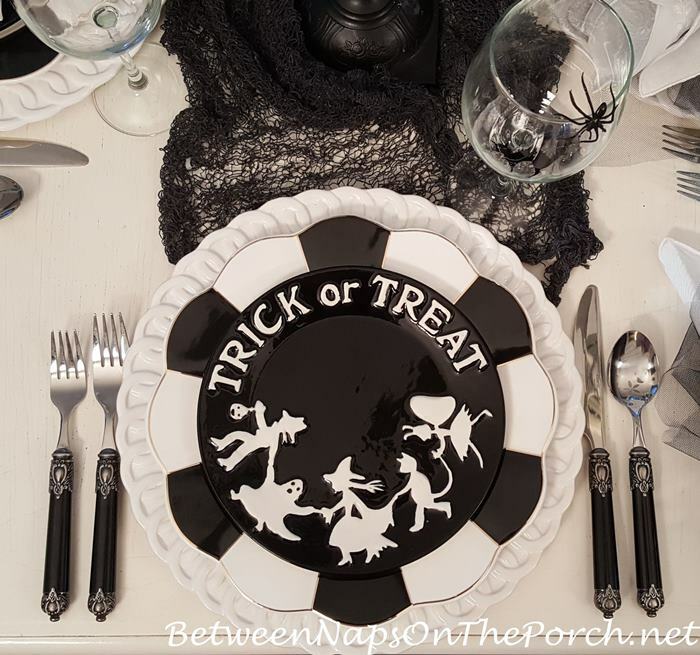 I love your black & white “Trick or Treat” plates…..too cute for a Halloween table!